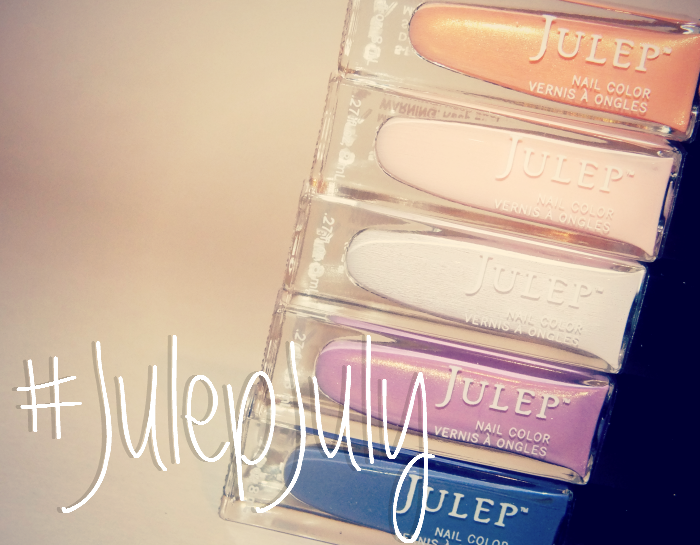 I love a good alliteration every now and then, as does the Canadian Beauty Bloggers it seems, as they've deemed July #JulepJuly. I just happened to have a few Julep polishes just waiting to be swatched. Read on to see Saaya, Jules, Ramona, Paulette and Iona in action! Saaya (Bombshell) is a peachy-apricot shimmer. The shimmer glows from within the shade making it pretty stunning in person. The formula tends to apply unevenly and as such required three coats. 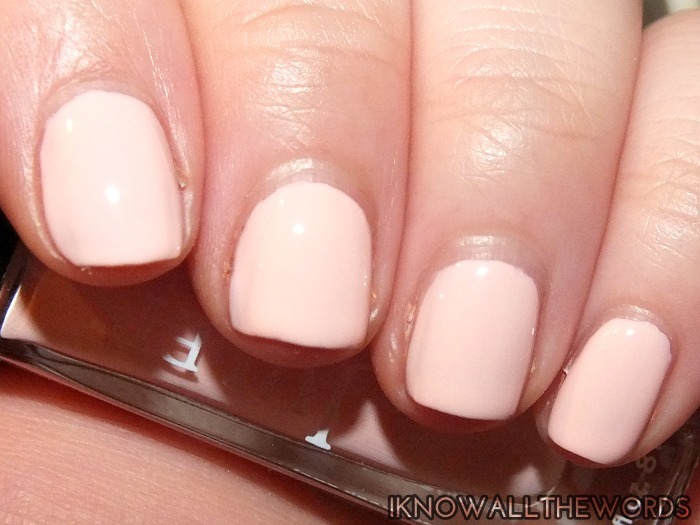 Jules (It Girl) is a whitened, powder pink with just the slightest hint of a peach tone. The formula was fairly thin, and was prone to dragging and streaking with thinner coats. A thicker coat did allow for easier application however. Two coats- one thin and one thick. Ramona (Classic with a Twist) is an pale, mauve-lavender shade that I immediately fell in love with. The shade didn't photograph very well, as flash washed it out, but no flash didn't give full clarity. Formula wise, Ramona is very similar to Jules, bit slightly thicker which helped reduce dragging/streaking. Two coats. Paulette (Boho Glam) is a pinky-lavender shade (just on the edge of Radiant Orchid territory) with glowing golden shimmer. Formula was pretty much perfect- two coats. Iona (It Girl) is what Julep calls a 'hydrangea blue creme' which I don't totally agree with, but I do love this shade. It's a dusty yet inky blue with slight purple undertones. The formula was a touch thick, but applied easily with two coats. 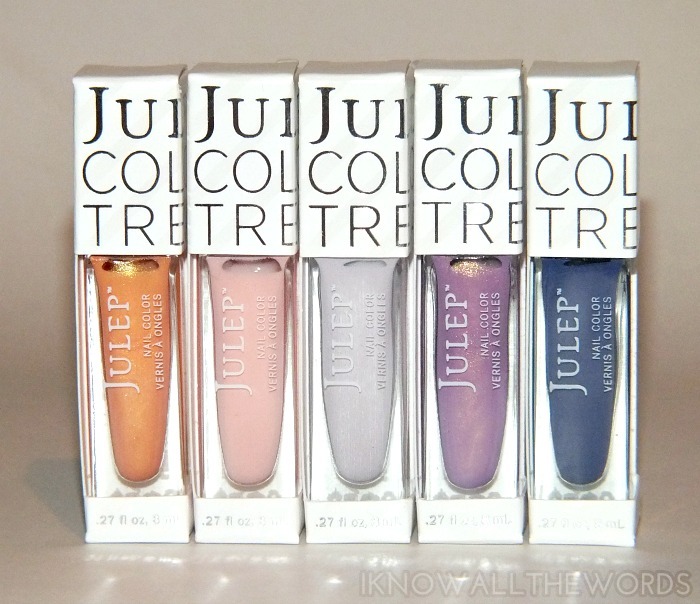 Do you have any of these shades in your Julep collection? Have a favourite Julep shade?